We believe the arts greatly enrich the basic educational experience and prepare students for lifelong learning. Dance, music, theatre arts and visual arts are central to the standards-based curriculum. Study in the arts helps students develop skills in creativity, communication, collaboration, making connections, analysis, critique, problem-solving and self-discipline. Elementary students explore music and visual arts. Magnet schools offer additional electives in dance, instrumental music (band, strings) and theatre. Even more choices become available in each of the arts areas for students to expand their technical and artistic skills in middle and high school. Parents can help students make real-world connections to the arts by talking with them about their classroom experiences, participating in their school-based activities and attending arts events in the community. Rigorous arts classes focus on technical skill development, creativity and artistic appreciation. Students share their work at school and in the community through performing festivals and visual arts displays. 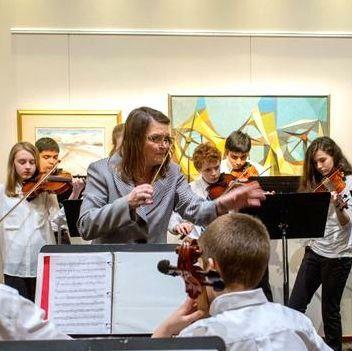 Along with the Wake Education Partnership and the City of Raleigh Arts Commission, our Arts Education Department produces Pieces of Gold – a celebration of the arts showcasing the creative excellence of Arts Education in our schools.